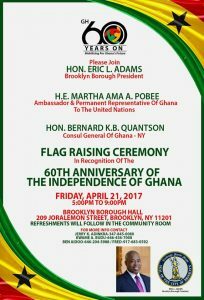 As part of Ghana’s year-long Diamond Jubilee celebrations, Brooklyn Borough President Eric L. Adams will be hosting a flag-raising ceremony at the Brooklyn Borough Hall on Friday April 21, 2017 from 5:00 pm to 9:00 pm. A statement says H. E. Martha Ama A. Pobee, Permanent Representative of Ghana to the United Nations and the Consular-General, New York, Hon. Bernard Quantson, will also be in attendance. 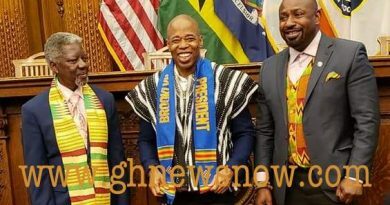 Speaking to Ghnewsnow on behalf of the event organizers, Jerry Kwabena Adinkra said there will also be a significant Ghanaian-American representation at the event. He said the ceremony will be a one-stop showcase for Ghanaian culture, cuisine, social and business interaction. “Apart from the main event, which is the flag-raising by Hon. 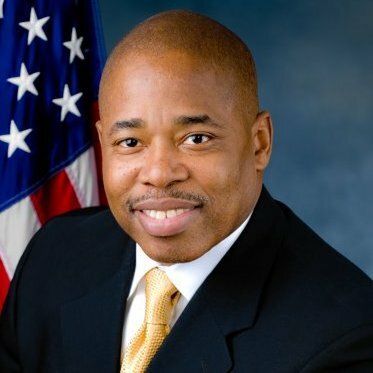 Eric L. Adams, there will also be room for showcasing Ghana in all it’s beauty; as well as social and business interactions”, he said. Ghana is recognized as one of the most culturally rich countries in Africa, the face of its people reflects a beautiful mosaic of several ethnic groups living peacefully together. It is without a doubt one of the most peaceful countries on the African continent. 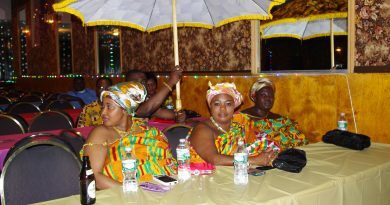 The event is uniquely tailored to draw in audiences from the multicultural/multiethnic communities in Brooklyn, the greater New York area and beyond and is to be held annually in commemoration of the bond between the peoples of the African continent and their kith and kin in the diaspora, with Ghana as a focal point. 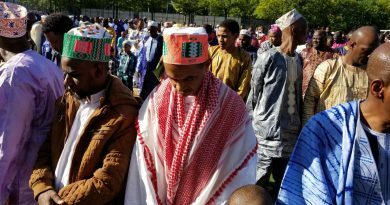 “All roads lead to 209 Joralemon St., Brooklyn, NY, on Friday April 21st, because it is a day that will soon be come known for the part it played in re-unifying the peoples of African descent” Mr. Adinkra said. In 1957, Ghana became the first nation to declare independence in sub-Saharan Africa.